We were delighted to take part in Visit Kent’s annual Big Weekend, which took place on Saturday 12 and Sunday 13 March, and were privileged with the task of presenting one lucky winner with a special golden ticket. For the Big Weekend we put on a series of tours for ticket winners which included a tasting of our different apple juices, a full guided tour of the vineyard and winery, followed by further tastings of the wines and ciders. Over 135 people attended on the tours, with ticket winners having been chosen from the Big Weekend draw which is only open to Kent residents, thank you to all who registered and came along! Now in its tenth annual year Visit Kent’s Big Weekend aims to encourage Kent residents to visit more local attraction on their doorstep. To celebrate the event’s centenary Visit Kent hid ten golden tickets at selected participating venues, of which Biddenden was one. The golden tickets give the lucky winners the chance to visit a selection of attractions around the county for free throughout the year. 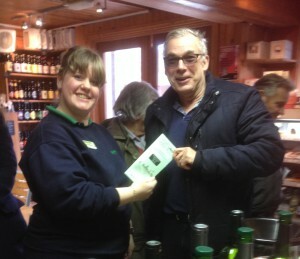 Biddenden’s golden ticket winner was drawn at random from those attending on the 3.30pm tour slot on the Saturday. Robert Patient, winner at Biddenden (pictured), said he was “over the moon” to have won the golden ticket. The tourism industry is an integral part of Kent’s economy and at Biddenden visits to the vineyard provide the chance to learn about English wine, cider and juice production and visitors are also able buy a selection of locally produced goodies including cheeses, gins, preserves, chocolates, jams and chutneys from the vineyard shop. We are open to visitors all year round and offer free admission and tastings. We have regular free tours on Saturday morning all year and Wednesdays from June to September. For more in depth experiences, we also offer private and group tours and larger groups can also choose from a range of joint tours which link up with other popular attractions across Kent. For more information on coming to the vineyard click here or call the office on 01580 291726.